They say that King Richard himself chose Chateau-Gaillard for construction and actively participated in the development of the project. 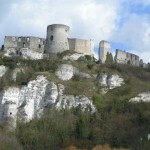 In 1852, Gaillard castle ruins were declared a historic monument of France. 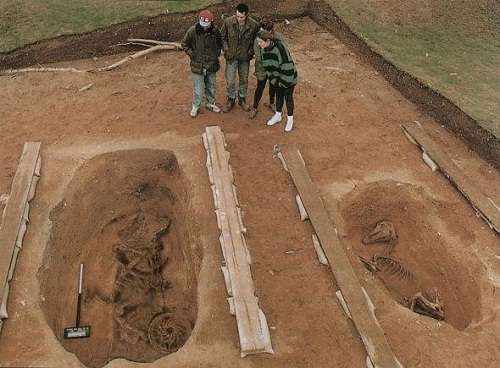 In May 2008, archaeologists from the University of Bristol, doing excavations at the castle Chateau-Gaillard (France), made ​​a sensational discovery. 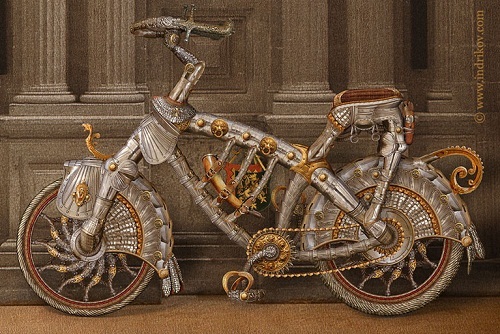 What was the amazement of archaeologists, when carefully managed to clean up the extracted pieces – it was part lain in the ground for almost nine centuries of knightly bike! A bicycle in the twelfth century, hard to believe, but there’s no doubt about the authenticity of burial. Back in Hallstatt, in Europe there were the basic skills of plastic iron processing, steel making occasional attempts by the carburization of iron blades and quenching. In the subsequent era of Laten was fully mastered the technology of manufacture of steel, complex methods of producing welded parts with high quality surface resistant to abrasion. 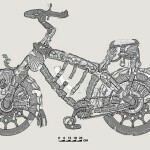 Basic design elements of this unusual medieval bike are made ​​of steel. Recipes for steel products with little or no significant changes have gone through all the Roman times. Gradually, scientists were able to recreate the look of the era of knights unusual means of transportation. Chateau-Gaillard finds are really very rare, “ancestor” of the modern bicycle. The frame is as easy as possible, and cloisonne structure like an airplane wing: steel bars running along the frame attached to the cross-fired plates. Outside the frame is clad with elements of knight’s armor, in particular, used Boots (Bracer) and Shoulders (Pauldron) fastened together by rivets round. Parts of the blades of swords (probably worn out on the battlefields) were used as the rigid sections to enhance the structural strength. Saddle is attached with eight forged steel arches, which served as a kind of shock absorbers during the ride. For interior seat leather and fabric were used, the remains are found during the excavations. 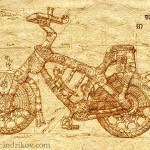 Special attention deserves the wheel of this wonderful bike. To reduce the shaking during movement on the metal rim wound horse hair, then wrapped in a circle with ribbons of coarse skin. 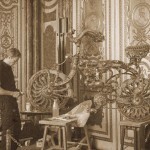 And only after that massive wheel mounted with an engraved pattern of iron needles, trimmed and the outside rim of the metal plates that can move relative to each other in the process of rolling. 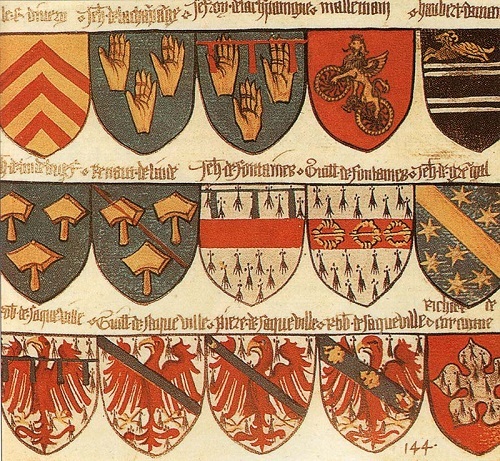 The wheels securely protected “enclosures-wings” made ​​from parts of the cuirasses and plate gloves. The excavation found two metal disks with sharp teeth on edge. One disc was dug out in an area of the rear wheel. 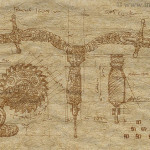 The second disc was found on the bottom of the frame with a handle with attached to it a sword (probably an ancient prototype of the connecting rod), together with the metallic components in the form of a pedal. Between the disks were found the remains of a chain with decorative overlays. 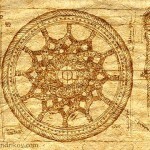 This is the first example of transmission, chain transmission mechanism applied in medieval Europe. 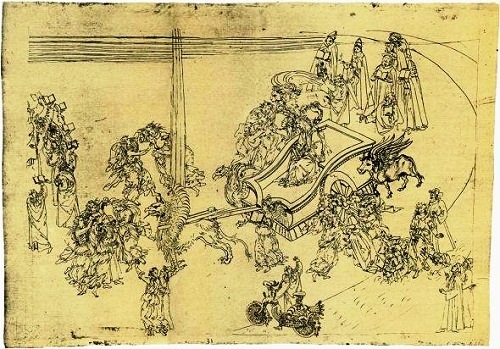 In this illustration, which describes an apocalyptic vision on the sides of the sacred procession, the slave angels family, we see biblical animals: an eagle, a winged bull, a winged lion and the angel-man with the book. 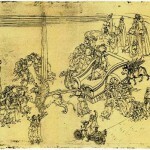 In a cart drawn by a griffin sits Beatrice. Pay attention to the human figure at the bottom of the illustration, what you see next to it? BIKE! 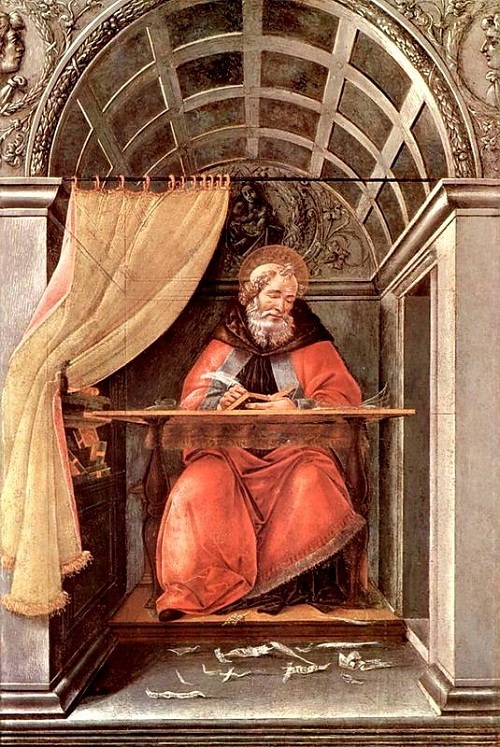 This is a very rare work by Botticelli, a comparative analysis of spectral and chemical composition of tempera paint, soil, and even wood fibers were made, and this another work by Botticelli, portrait of “St. Augustine” (1495). Compositions are identical. Incidentally, the backgrounds of “St. Augustine” and this picture are very similar. Apparently Botticelli created both products at one time. 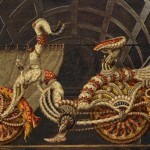 In the original decor, obviously seen the female version of the bicycle, and there is a visible link with the earlier masters masterpiece “The Birth of Venus”. 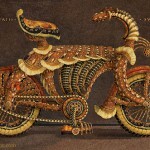 Art historians have found that during the life of Botticelli was “portrait of a bicycle”. 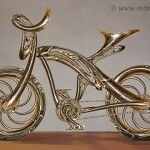 Why bicycle is clearly female? 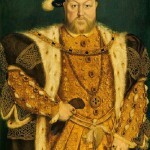 German Hans Holbein (1497-1543), painter and draftsman, one of the greatest German artists of the Renaissance, an outstanding portraitist and court painter of Henry VIII. The same year he wrote a famous portrait of Henry, now stored in the Roman National Gallery. 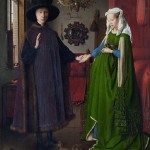 A picture of a Flemish painter of early Renaissance masters – the portrait of Jan van Eyck (approx. 1385-1441) Everyone knows his masterpiece “‘Arnolfini’ Portrait” but hardly anyone knows his other picture of the same period. And again, a miracle. 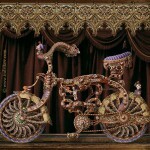 Absolutely fantastic in concept and at the same time, unreal, brilliantly performed cycling fantasy of the artist. 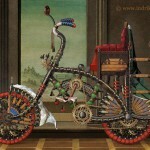 Now we know exactly Van Eyck invented not only oil paints, he also was the inventor of a wonderful bike. Cycling is not just a vehicle, a means of creative expression, lifestyle and worldview, that’s why such well-known artists depicted a bicycle. 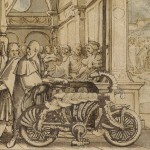 Because they experienced a feeling of true freedom at the time of the creative act, could not pass by this amazing in its simplicity, a two-wheeled “freedom of the generator.” Knights of the Order could make long trips with a minimum food supplies and equipment since it does not require maintenance and feeding as horses do. 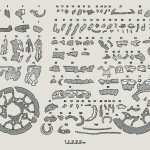 Bike parts were created in France, Germany, Italy, Belgium, Switzerland, China, Japan and Russia. And in the First and Second World Wars army cyclists performed well. 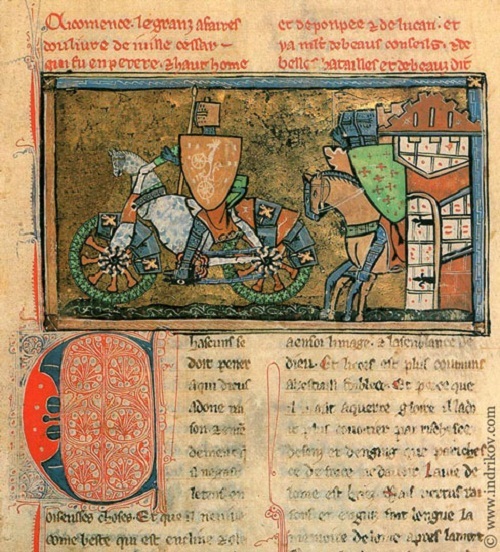 On this miniature of the ancient manuscripts, we see in front of the troops, acting out of the fortress, armed warrior riding a two-wheeled cart resembling a surprising bicycle. Pay attention to the shield of a warrior. 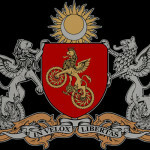 On the red background of the shield, we see the language of heraldry, the lion-based rebels on two wheels. 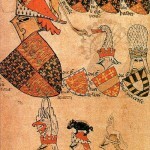 This is one of the first images of the emblem of the Knights’ Order of the Sun and the Moon’. 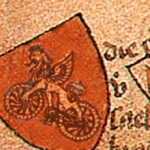 Two-wheeled “handsome,” was called “Richard the Lion-heart”, in honor of the legendary master of the castle Chateau-Gaillard, whose land had been saved for so long, and, finally, archaeologists discovered his amazing secret. 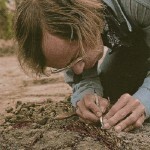 The earth keeps many secrets, but even more unknown to the man himself. 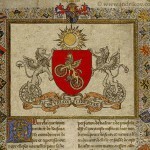 Cycling – the knighthood means of transportation. The cyclist is given the strength, and it is in harmony with nature, rather than enslaving it.